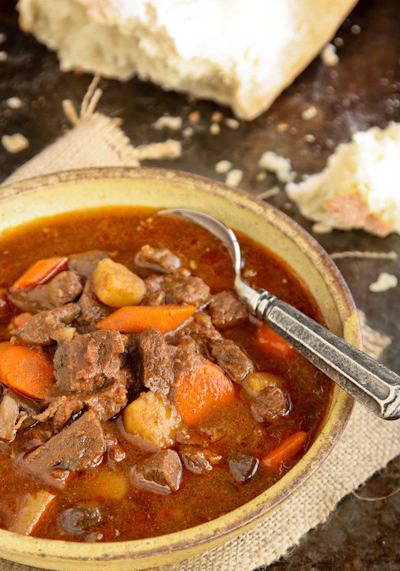 You'll be blown away by our collection of 12 Easy Slow Cooker Goulash Recipes. These easy slow cooker goulash recipes range from traditional Hungarian goulash, to Americanized versions, and beyond. However you enjoy this traditional beef stew, you're sure to love these simple slow cooker recipes. They are hearty, rich, and completely delicious -- the perfect solution to cooking during the colder months. Feed your family to their hearts' content with these classic and modern takes on goulash. In case you aren't familiar with traditional Hungarian goulash, it's made with beef, onions, Hungarian paprika powder, tomatoes, and green pepper. According to some recipes, the hearty stew is poured over cooked potatoes or noodles. The stew has a thick consistency -- sauce-like -- and is prepared as a main dish. Americans have interpreted classic goulash recipes in a variety of ways, and we've even come up with wonderful recipes for making goulash in the slow cooker. Most American goulash recipes -- a few of which we've gathered for you in this collection -- are made with tomato broth, tomato paste, macaroni noodles, beef and carrots. Whichever slow cooker goulash recipe catches your eye, we're sure you'll be thoroughly pleased with your choice. 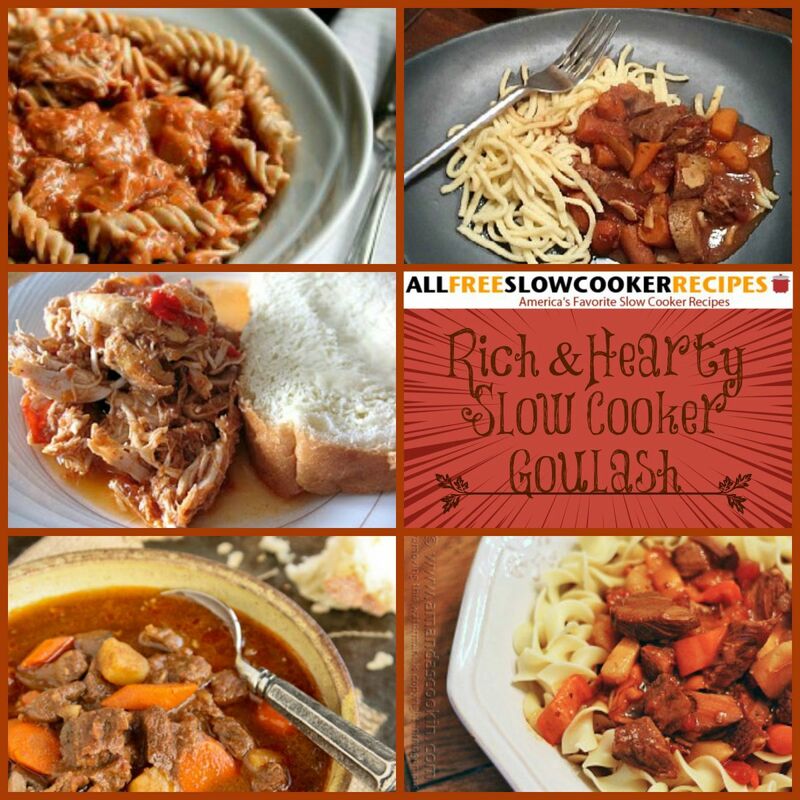 Easy macaroni goulash, beef goulash soup, American goulash recipes, and Traditional Hungarian goulashes are all accounted for in our 12 Easy Slow Cooker Goulash Recipes collection. These rich stew recipes for the cooker are sure to warm you up, fill your belly, and keep your mind off the cold weather outside. If you're looking for even more hearty soups and stews, download our free eCookbook, "18 of Our Best Slow Cooker Soups, Stews and Chili Recipes." These recipes will warm you right up! These slow cooker goulash recipes are in line with the traditional Hungarian style. We've included a few recipes -- like our Slow Cooker Hungarian Goulash with Quinoa (recipe below) -- that put a spin on authentic goulash, but that are equally as delicious. Our rich and hearty Slow Cooker Hungarian Goulash and Noodles (pictured) is so authentic, you'll feel like you've just stepped on the train in Budapest. No matter what type of hearty goulash for the slow cooker you decide to make, these traditional Hungarian recipes and other slow cooker goulash recipes are some of the best around. If you love easy-to-make dinners for the slow cooker, make sure to check out our, "Lazy Slow Cooker Macaroni 15: Slow Cooker Macaroni and Cheese Recipes." You'll find a tasty variety of slow cooker macaroni dishes to make for every occasion! These slow cooker goulash recipes have been made with a modern interpretation. They are so good, you won't be able to stop eating until you've cleared your plate! Our Slow Cooker Chicken Goulash (recipe below) gives you something different by using chicken instead of beef. Our Slow Cooker Macaroni and Beef (pictured) is wonderfully cheesy and full of tomato flavor. This amped-up version of macaroni and cheese with a goulash twist, is a great option for lazy nights when you feel like curling up by the fire.